FARE Blog | How big is this peanut crop? How big is this peanut crop? The 2017 peanut harvest is well underway with over 70 percent of the Georgia crop dug and over 50 percent harvested. While Hurricane Irma negatively impacted the cotton crop, there was no widespread negative impact on peanuts. Both irrigated and dryland peanuts are looking good. Peanut yields in Georgia and the rest of the peanut producing states will be up from last year with the big question being by how much and whether new records will be set. USDA forecasts for the U.S. are for a yield of 4,257 pounds per acre with the GA yield at 4,700 pounds per acre, both of which would set new records. With 1.9 million acres planted in the U.S. and 840 thousand acres planted in GA, this crop also has the potential to set a new record level of production. A few questions have surfaced that are worth discussing as we wait for the harvest to be completed in the coming weeks. Is there sufficient warehouse capacity to store the expected crop? As of mid-September there were 3.8 million tons of approved warehouse capacity in the U.S. with 1.9 million tons in GA. At first look, this has the potential to create a shortage of warehouse space of about 118 thousand tons in the U.S. and about 12 thousand tons in GA. However, expectations are that a worst case scenario would be a logistical issue and not a question of where to store these peanuts. Coming into this harvest, warehouses have been basically empty and shellers are prepared to start moving the current crop through the system. Combine that with a longer than typical planting season and the industry should have little problem in finding space for these peanuts. What is the size of this crop going to do to market prices? This becomes a question of supply and demand. Basic economics tells us that as the supply increases prices will be driven down. There is little anyone can do to prevent the supply situation at this point, so one must look towards demand. The industry needs to continue to look for opportunities to expand demand in order to maintain or increase prices. We have seen domestic use of peanuts for food increase in recent years but there are few opportunities to impact consumer demand in a short period of time. The greatest opportunity for finding a market for this crop is through increased exports. Through August, total U.S. exports have been down compared to last year, and this is likely due to prices that increased late last year. While it is likely that exports will pick up, there is little indication that it will be without a drop in price. Right now the market is waiting to see how large this crop will be and that will determine how low the price will go to move this crop. Even with exports forecast to increase from last year, the ending stock created by this crop is expected to reach the heights of 2012. The industry needs to find a home for these peanuts as prices will be impacted until this surplus can be moved. So the big question of course is whether the crop will meet these yield expectations. We really won’t know until the harvest is complete but we can look at some of the historical USDA projections to get an idea of how accurate they have been in forecasting yields. 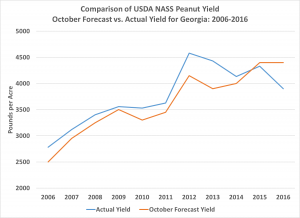 As can be seen in the figure above, the blue line represents the actual yield in GA and the orange line represents the October forecast yield released by the USDA. This graph starts in 2006 which was when Georgia-06g was released. This variety currently represents about 80 percent of the peanuts planted in GA. We can see that every year, except the last two years, the USDA October forecast was less than the actual final yields. Generally this would project a very favorable expectation on the USDA forecast model as typically underestimating yields. There is further evidence of underestimating in 2012 when there was a big spike in yield such as is expected this year. The two most recent years when the USDA overestimated yields were during a period of a downward trend from the peak. It will be interesting to see what the final yield number is for 2017 and how that compares to the current forecast of 4,700 pounds per acre. This is certainly a big spike in yield from our actual 2016 yield of 3,900 pounds per acre, but with no major crop and weather issues this year it might just be achievable. Posted in Marketing, Peanuts, Row Crops. Bookmark the permalink.